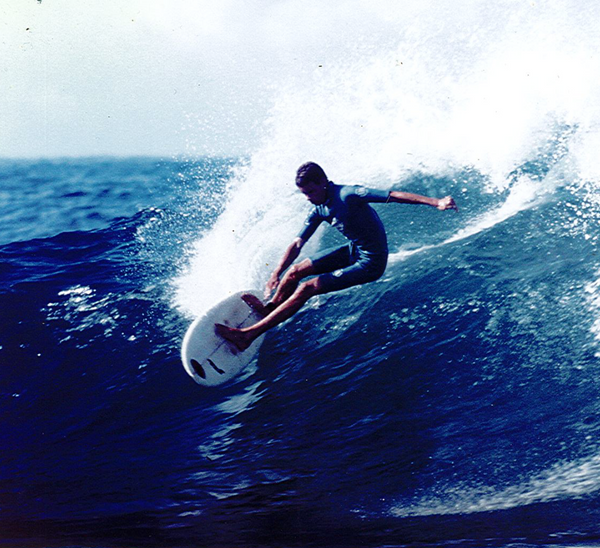 Surfing and coaching have been such a big part of my life for as long as I can remember. 2016 marks 30 years as a coach. I love what I do and I am just as enthusiastic now in helping surfers improve their surfing as I was when I first started in 1986. It’s been a great ride, one I hope to continue for a couple more decades to come. Following are some key moments and influential people who helped me in the first decade of my surf-coaching career. Like all journeys, the people you meet enrich the experience and I want to acknowledge how important they have been to my long-term success. Starting out: I just finished my sport coaching course at University and like most graduates I really wasn’t sure what direction I should take. 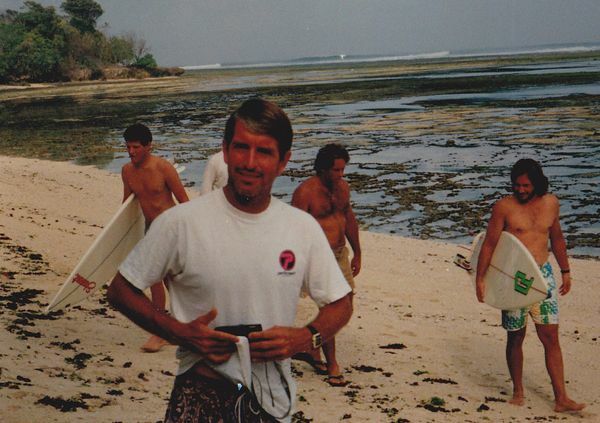 I could go into the fitness industry, coaching football, or surfing – all areas I knew well. What lead me to surf coaching was the fact that I did a major work on the “Biomechanics of the Forehand Cutback” in my final semester of the course and I just found the theory of how surfing works fascinating. 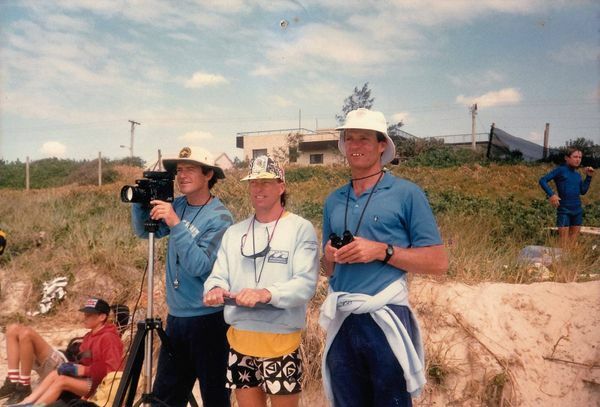 As a result I started dabbling in filming and coaching a few surfers in the Yamba area of New South Wales’s north coast where I was living at the time. The first surfer: The first surfer I remember coaching was Navrin Fox, the son of a longtime and well respected surfboard shaper Albert Fox, from Yamba. In those days I was a 2 – 3 surfs a day man and it was weird standing on the beach filming the young 11 year old Navrin, in super fun 3 – 5 foot Angourie Point – one of my all-time favorite waves in the world. My first products: My first products I made was a fitness training manual for surfers entitled – “Conditioning For Surfers”. I probably had made a couple of hundred copies and sold about half. 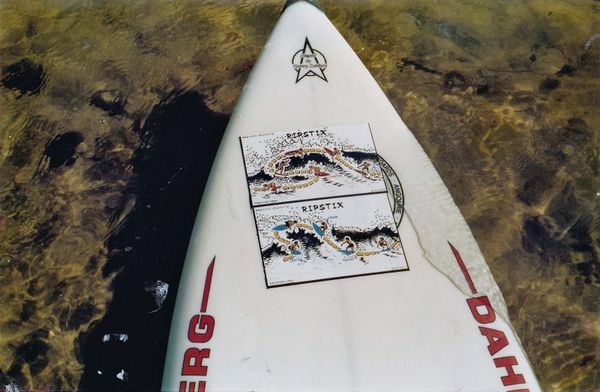 The next was a pack of instructional stickers called “Ripstix” stickers, that were designed to be stuck on the nose of a surfboard so that surfers could remind themselves of the correct technique when in the water. When I look back at it now, they were really basic, but I thoroughly enjoyed working on both projects and bringing them to market. Didn’t make any money, but I learnt a lot. 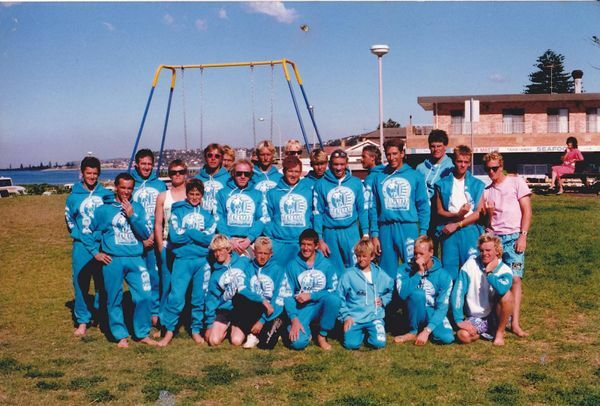 “Surfing NSW – Director of Coaching”: In 1988 I was offered the job of Coaching Director for Surfing NSW. It was an honorary position that was supposed to become a paid position in the future. Of course it never did, and I worked fulltime elsewhere and did my honorary duties in my spare time. I didn’t mind so much as I was highly motivated and wanted to be involved. Over the course of the next 6-8 years I organized regular training camps around NSW and worked with NSW state teams at Australian titles each year. My First Serious Surfer: I was lucky to have met Cronulla surfer Glenn Pringle at the Australian Titles when he was a member of my first NSW team that I coached. Glenn was a highly motivated surfer and was a contest machine. Over the next few years, I reckon I learn just as much from him as he learnt from me. It was an absolute pleasure to work with such a great competitor and to this day I think he is the best surfer I have ever coached. Glenn now works with young surfers in his hometown of Cronulla, sharing his extensive surfing knowledge with future generations of surfers. 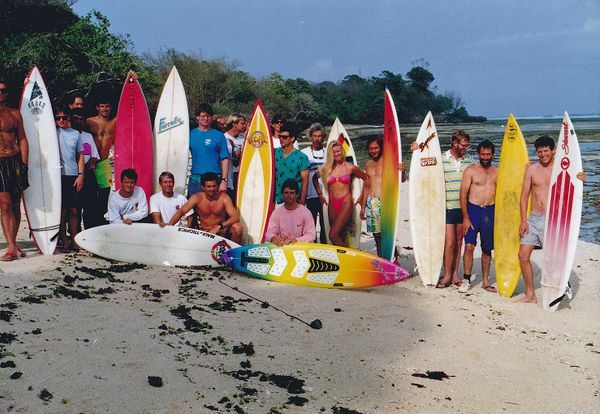 Surfers Medical Conference – G-Land: In 1991 I was asked to go to G-land, Indonesia to present at one of the first Surfers Medical Association conferences. These conferences were all about medical professionals from around the globe coming together to surf and discuss their medical experiences as it related to surfing. I presented on “Understanding Surfing Technique” and “Developing Surfers”. This was my first experience presenting internationally, which I was to do a lot more of later in my career. 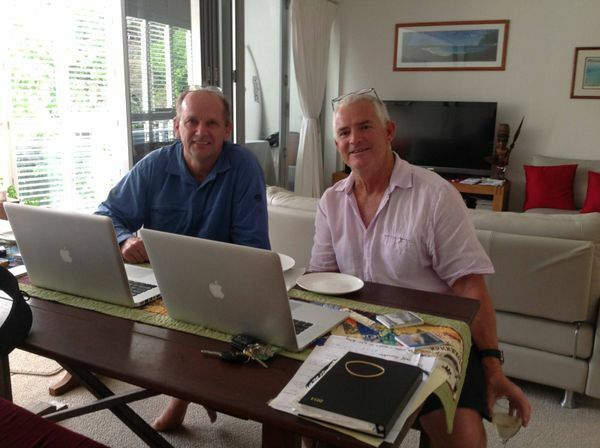 Aussie Mentors: Besides Dr. Jones, Australian Sport Psychologist, Dr. Michael Martin and Sport Scientist, Mark Andrew were extremely beneficial to me and my career in my first decade of coaching. Both generously allowed me to bounce my ideas and training concepts off them. At this time there were no books, guides, or courses on how to coach surfers. So reading everything on coaching sport [no matter what sport] and trial and error when on the beach was the order of the day. Having these two experienced sport professionals on speed dial was invaluable in increasing my confidence designing and conducting coaching programs in those early years. And really these three mentors [ Dr Jones, Michael, and Mark ] shaped the coach I am today. Thanks guys. 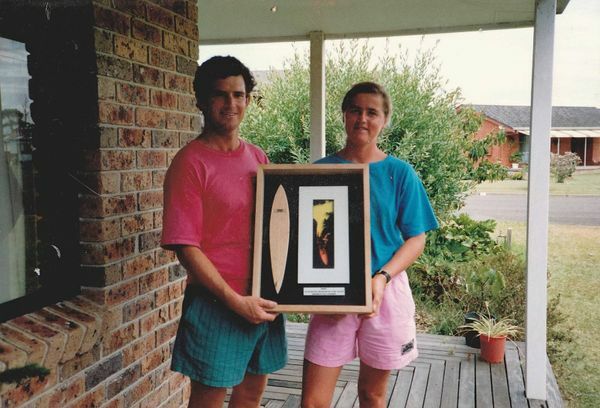 Beau Emerton and Neridah Falconer: In the early 90’s I started coaching surfers Beau Emerton and Neridah Falconer along with many other quality surfers. Beau and Neridah both went on to win world junior titles, before qualifying for the world’s elite tour. Both won many international events over a number of years, with Neridah winning most of the women’s events on tour over her career, culminating in her winning the triple crown in Hawaii in her final year on tour. Beau won the Billabong Pro [ early version of the Quiksilver Pro] on the gold coast and a highlight was beating Kelly Slater in the final at the US Open in Huntington beach one year. Other coaches: During this first decade there were a few other guys doing a good job with their surfers. 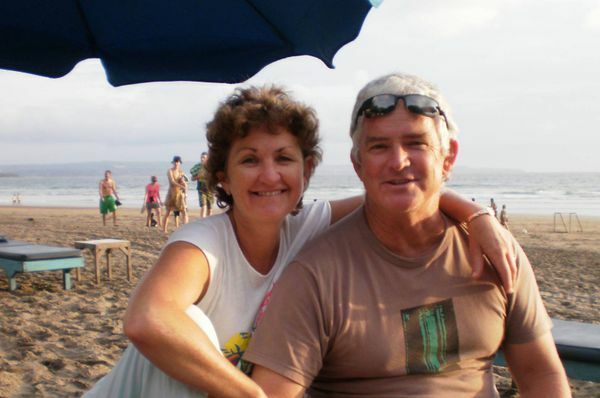 Steve Foreman from Byron Bay was one particular coach who had a lot of success. He later became Layne Beachley’s main coach during her career. Others included Newcastle’s Terry McKenna, South Coast’s Greg Orphin, amongst others. Trish: Without the support of Trish, my wife of 34 years, during this first decade, the rest of the journey wouldn’t have taken place. Most women would have had enough after a couple of years of no money, and moving a couple of times to follow “my” dreams of being a surf coach. She hung in, supported me, and looking back has enjoyed the “roller coaster” of me being a surf coach when there really wasn’t a career in those early years. The next decade was all about winning surf contests and creating instructional products. 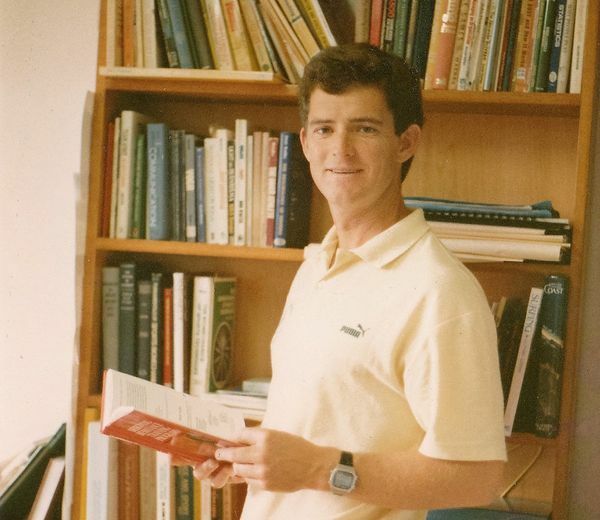 That story will be outlined in my next post – “30 Years A Coach – The 2nd Decade – Learning How to Win”.